On P3X-562, the team discovers a valley of blue crystals. When O'Neill touches one, he is struck down by its powerful energy, and a duplicate O'Neill appears. 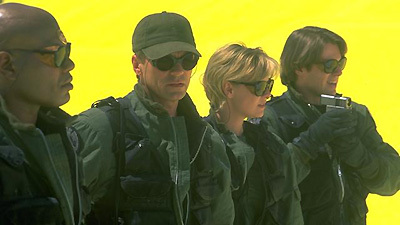 Returning to Earth, the duplicate seeks out Sara, O'Neill's estranged wife, and their son Charlie who died years earlier. Meanwhile, the real O'Neill returns through the gate, and SG-1 learns that the crystals are really energy beings. In a final encounter, the duplicate explains that he wanted only to heal the injured O'Neill, but that his greatest pain was the loss of his son, a grief that O'Neill is only now able to accept. Jack and Sara had separated after the accidental self-inflicted shooting death of their son Charlie. Carter has a brother, niece, and nephew in San Diego. Goa'uld had destroyed the Unity in revenge for injuring one of them. Blue quartz crystal life forms have electromagnetic energy with the ability to emulate and recreate other life forms. The Unity Crystal's energy decays on Earth because Earth's electromagnetic field is stronger than on P3X-562.